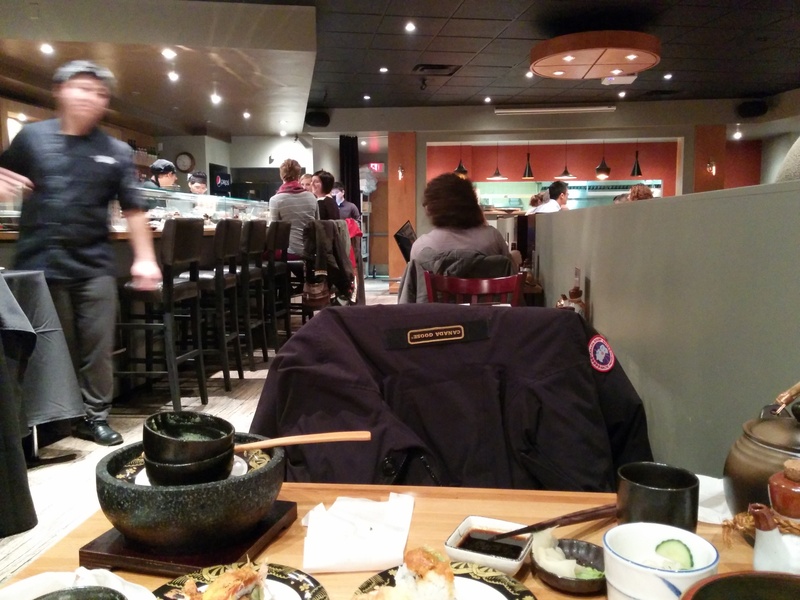 So in celebration of finishing our exams, we decided to treat ourselves to one of the most talked about sushi restaurants in Montreal. 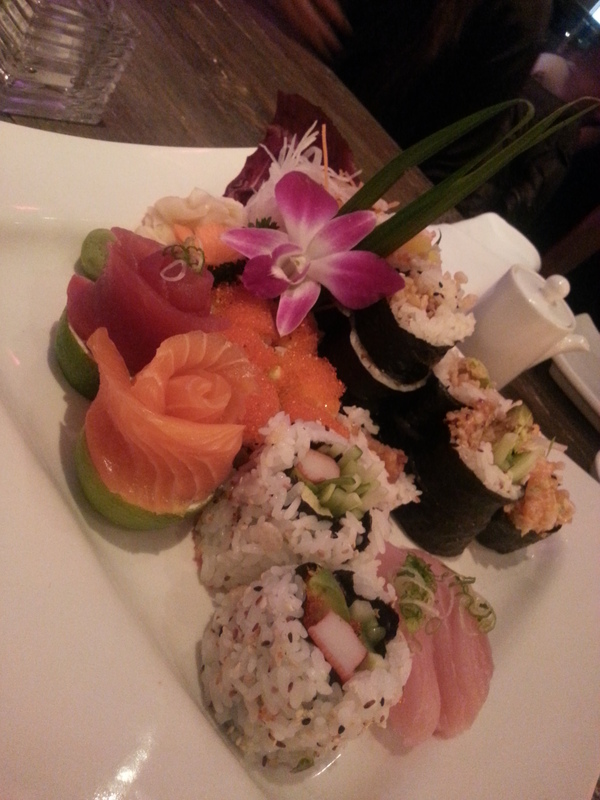 It has been quoted by MANY as the “best sushi restaurant in Montrela”. Hence, we wanted to see how “good” it is. Equipped in our team were foodies T, M, K, a Japanese authentic A, and myself. M, A and myself have all been to Japan and definitely had the best sushi of our lives there. 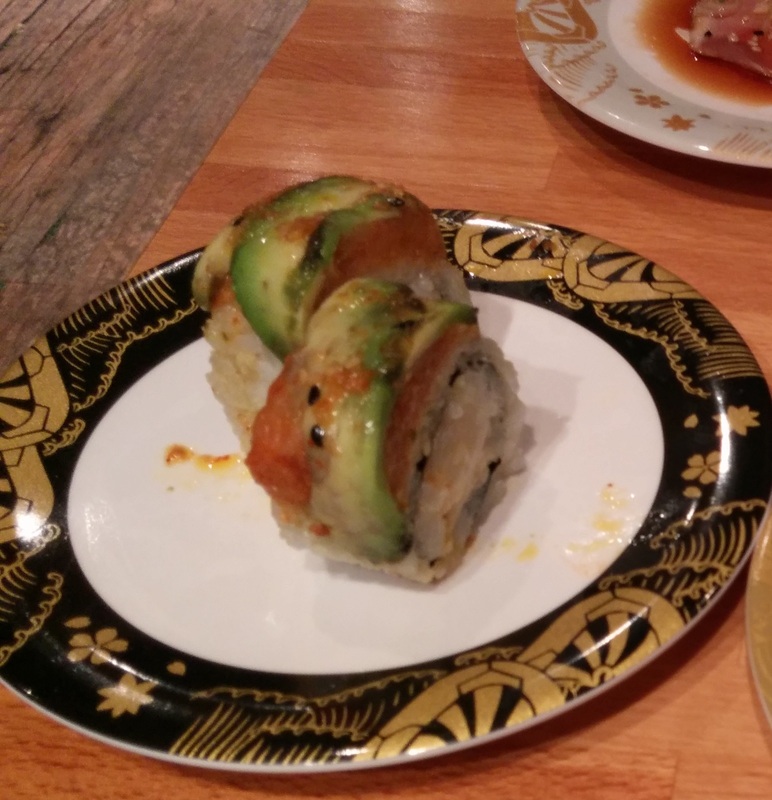 We were excited to be able to find a place that might be able to match the quality of sushi there. So we arrived, and I was honestly very nervous. 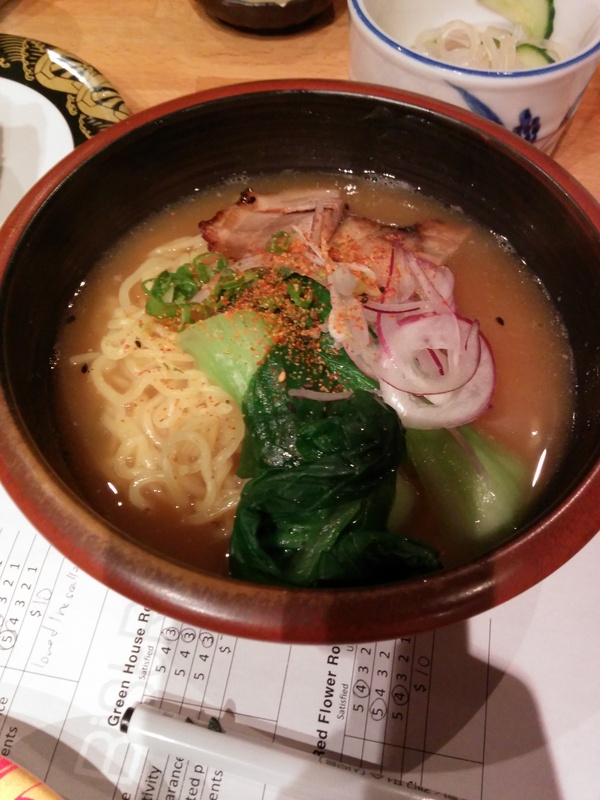 After our last horrible experience at Maiko, we hoped this would not be a disappointment. We were seated promptly, as T made a reservation. 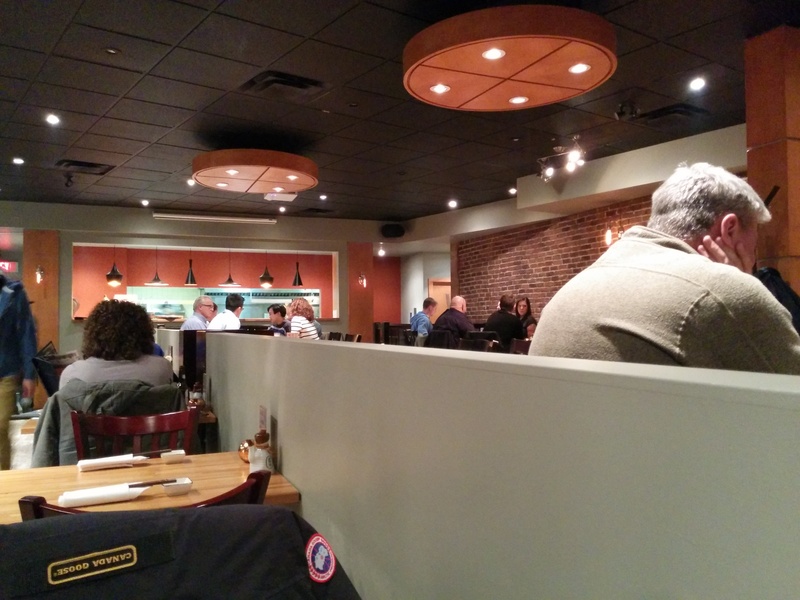 The waitress was very friendly, not intrusive and quite detailed. She realized that some of us couldn’t see the cocktail menu as the menus are on the three walls of the restaurant, and the angling of our seat made it impossible to see. She then ran through the list very efficiently, highlighting key ingredients without any memory lapse. Amazing. She then proceeded to explain to us the main menu. We decided that we would just share the sushi sets and try how good their fish was. We settled for the Sashimi Moriawase (18 pcs, 5-6 types of different fish), the Nigiri Moriawase (12 pcs, 6 types of fish), the Seasonal Maki (8-9 pcs), and the Chef Special Maki (8-9 pcs). The exact menu changes as they will change up the types of fish served in accordance to market pricing, and what’s in season. 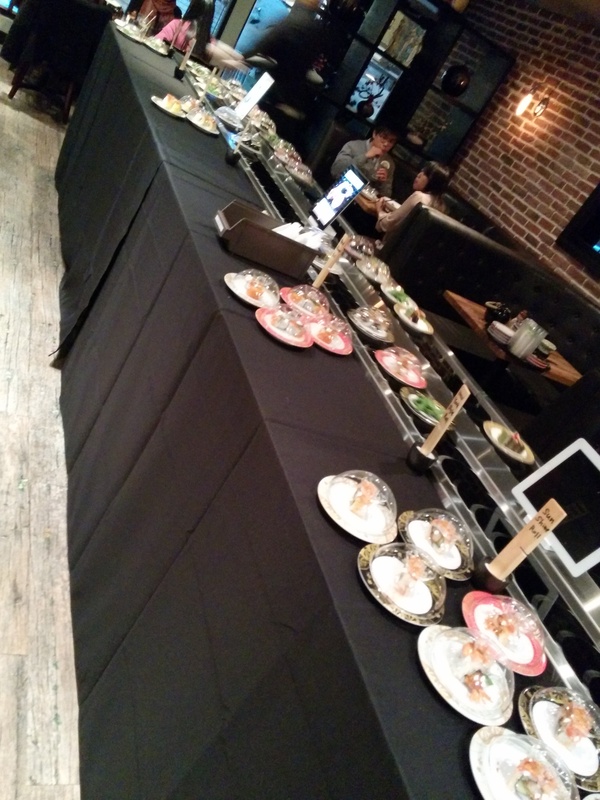 Regrettably, I don’t remember all the fish that we were served, but it included Salmon, Tuna, Red Snapper, Albacore and Mackerel. This was for both the sashimi and the nigiri. The sashimi was served with three dipping sauces which were absolutely amazing. The first was a sesame carrot oil mixture, very thin and didn’t appeal too much to me. The second was the basil edamame, which was absolutely amazing. The third was a mixture of cilantro, celery and tomato, chopped up with some spices. This was also very good, slightly sour and had an interesting punch to it. The Nigiri was garnished with different types of ingredients, including Spanish Caviar, chives, green onion. Some were also very lightly drizzled with a sauce, making the flavours more interesting, as well as melding the garnishes with the fish. 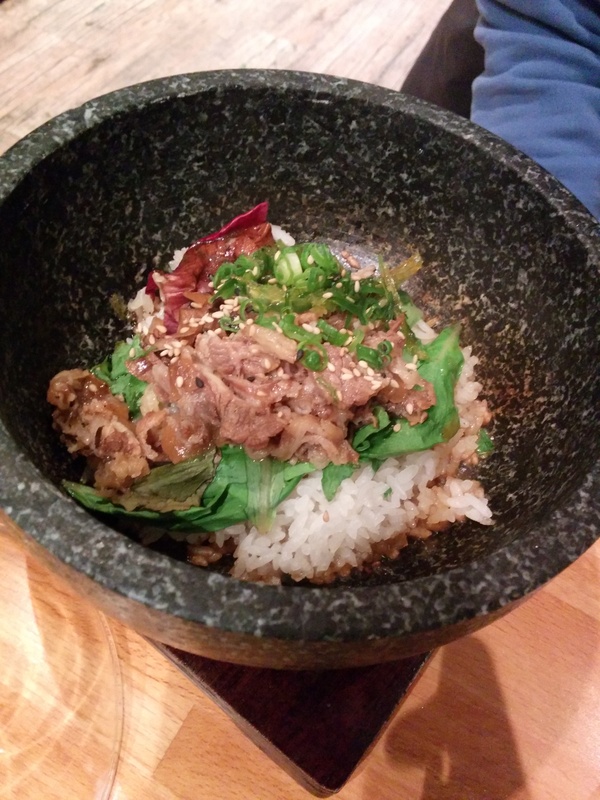 I’ve been to several “Japanese fusion” restaurants to this day, and this has definitely got to be the most well done combinations I’ve ever tasted. The Seasonal Maki was a massive roll filled with salmon, tuna, albacore tartare in the centre, wrapped with rice and then seaweed. On top, there was a seared piece of Eel, thoroughly marinated and some more garnishings. 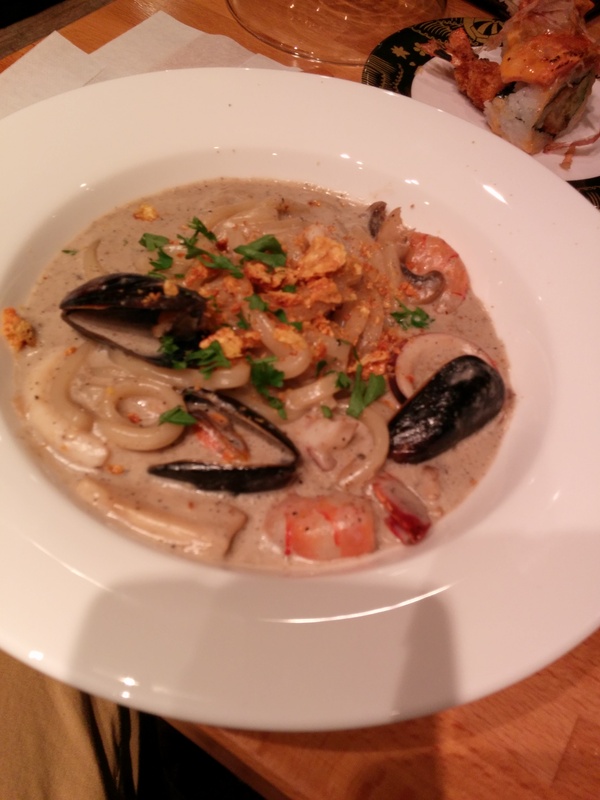 This was absolutely amazing, and was packed with rich flavours, and was my favourite dish. The Chef Special Maki was an even more elaborate roll, with the same tartare as the Seasonal Maki, but the garnishings were different. It came with seared albacore, drizzled with truffle oil, topped with a slice of jalepeno peppers and a dollop of carrot puree. 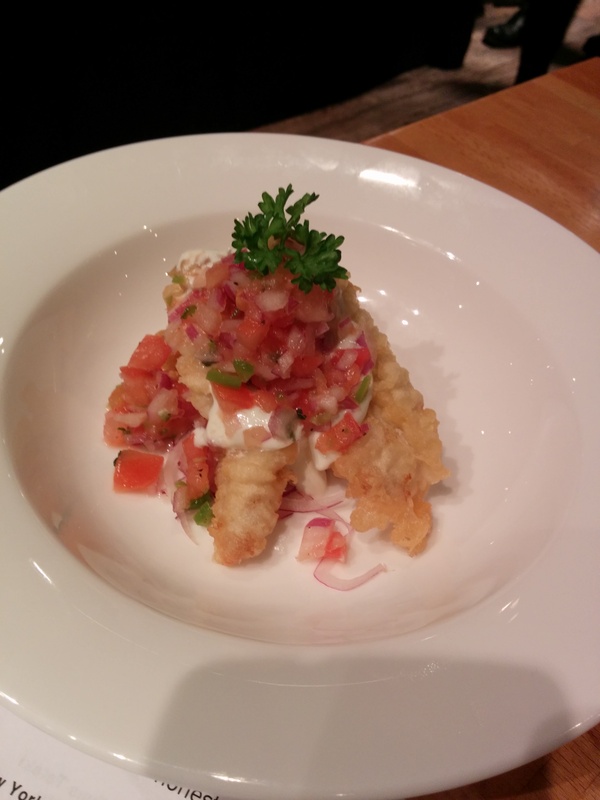 It was served with spicy mayo next to it for you to indulge if you so please. To be honest I didn’t taste the truffle oil, but the carrot puree and the jalopeno was genius. The spiciness of the jalapeno worked with the tartare amazingly, and the carrot puree just added that lighter taste and texture to make it interesting. 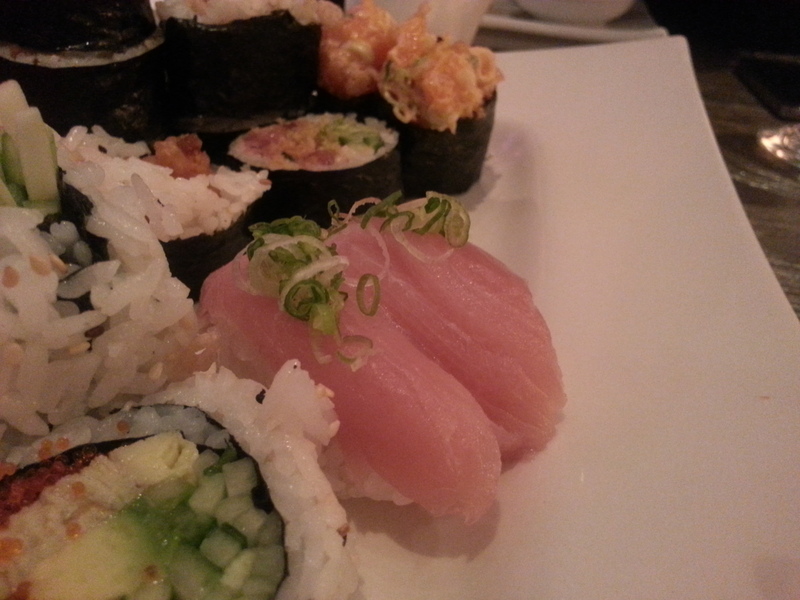 I didn’t taste much of the albacore though. As the night was winding down, we started craving for dessert. 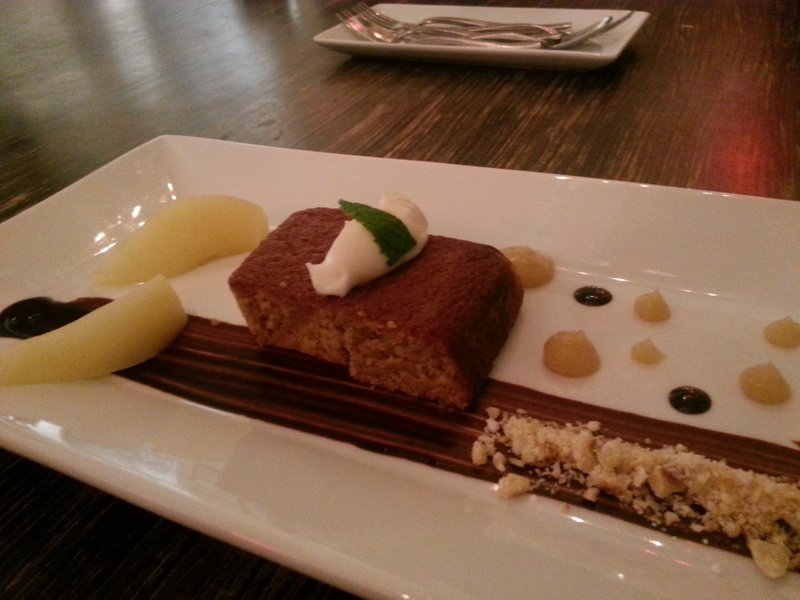 We had heard from our waitress that there was a hazelnut cake (this was part of their $75, 5-course tasting menu). We decided to hear what other desserts they had, which included a mousse pot, with lime yoghurt at the bottom, followed by poached persimmons and chocolate mousse, then topped with a chocolate brownie on top. It came in a cute mason jar. I didn’t order it because the lime yoghurt put me off, even though I was dying to try the persimmons. They also had Seaseme, Green Tea icecream, but I wasn’t interested. So I went for the hazelnut cake. It came with two pieces of cleanly poached pear (no sauce or reductions), and pear cream on top. To decorate the plate, pear purée and chocolate sauce, with a small sprinkling of roughly groundhazelnuts. The cake was very dense, yet retained a lot of moisture. M, who is a patisserie chef, was wary of this cake as they are usually dry, went with the mousse pot. However, even she was surprised at the texture of the cake. The pear cream on top had a slight saltiness to it, adding amazing complexity to the whole dish. Obviously, this is no Tsukiji Market, and we’re not being served purely the freshest fish, so don’t come in expecting that. However, they do a good job with trying to get the freshest fish they can, and create extremely interesting combinations, giving true meaning to fusion. I thoroughly enjoyed my whole experience there. Unlike most other places, which overdo the sauces and garnishings, completely masking any trace of the flavours of the fish, Park Sushi uses their additions wisely to complement the flavours of different fish. They understand the importance of getting fresh fish, and therefore did not have any set fish that’s always available on the menu. 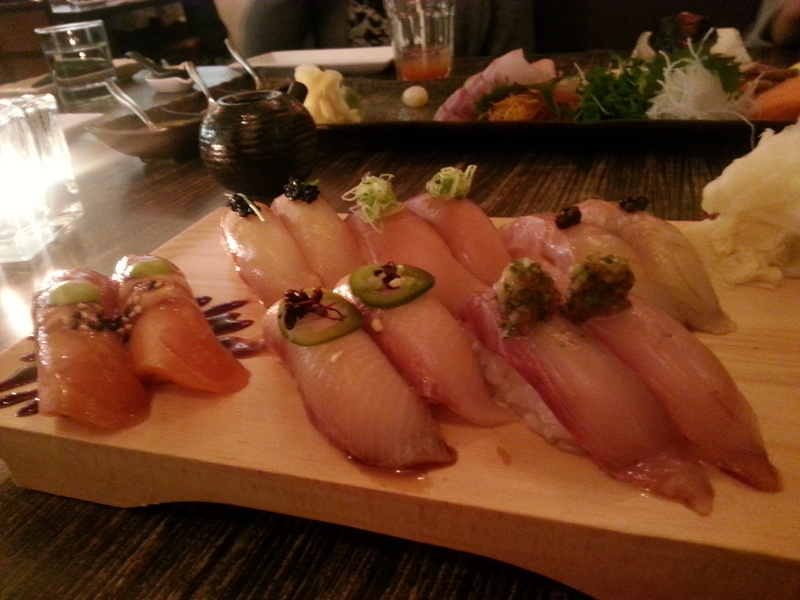 As a note, They do omakase ($95) tasting menu which is more sushi-based than the #75 tasting menu. Both comes with soup, salad and a dessert, but the two mains are different. If you have a couple extra bucks to spend, and you’re a sushi lover, I do recommend this place. 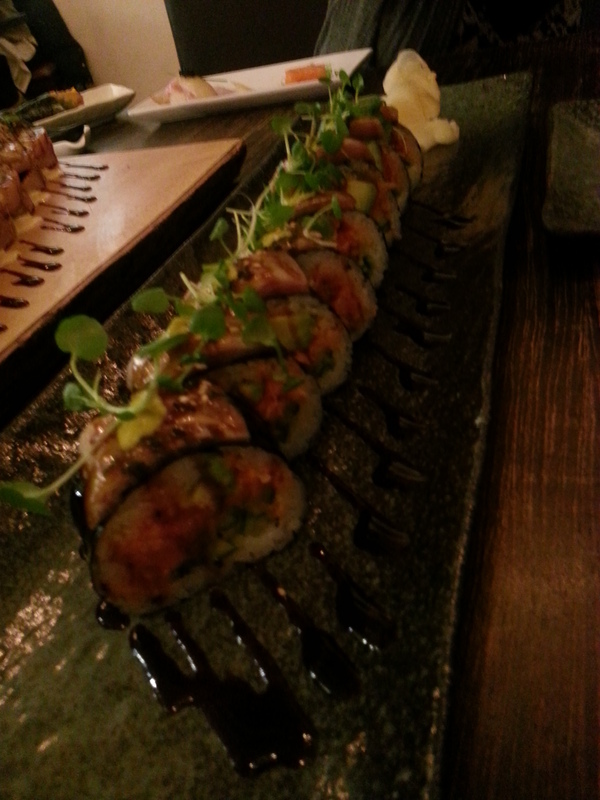 It has got to be the best sushi I’ve had in Montreal thus far. Our next adventure in this category will likely be Juni. This friday was Tamishka’s birthday and we celebrated by going out for sushi (because we were all craving it) and some drinks after. We were recommended by our good friend who hadn’t been to Maiko in a long time but remembered it to be up to par with good sushi places. We had all chatted about our endeavours in Japan and our love for sushi and that’s what kick-started our craving. So a reservation was made for the 5 of us and we had some high expectations for this fairly pricey sushi restaurant. 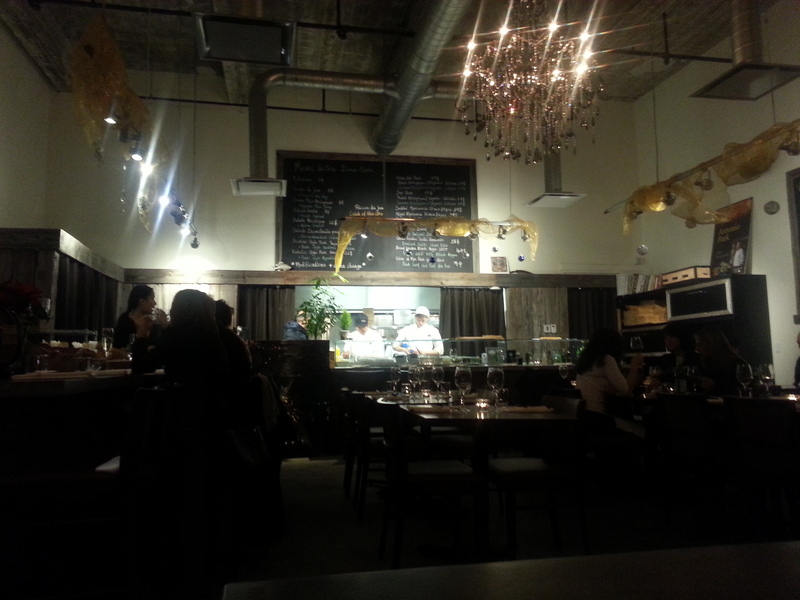 Their site showed an exquisite display of sushi and as we walked in the decor was quite good. 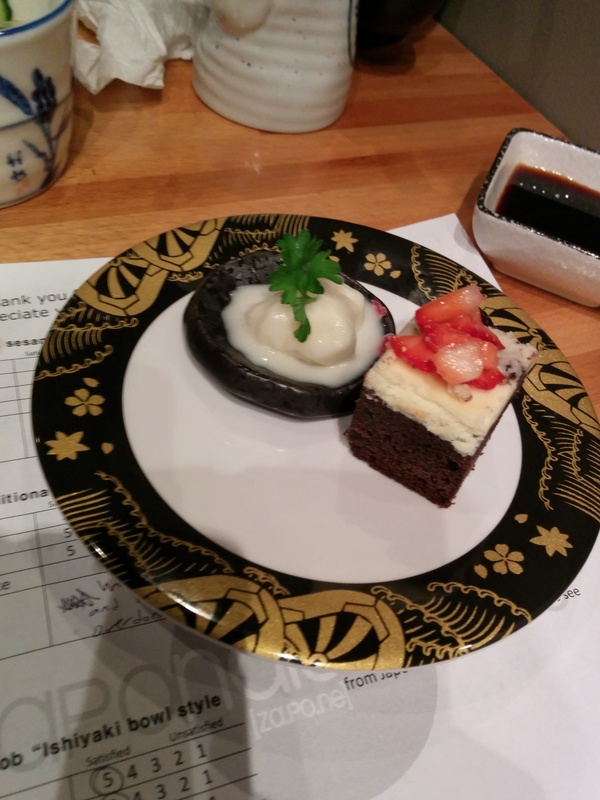 It had a high end and modern flair to it with Japanese-theme and cultured accents. I thought it was nice. There were some Christmas decorations too which I actually enjoyed because I’m excited for the holidays. I will say this outright. This restaurant is awful for sushi. Three of us shared some dishes: two Chef Specials ($18 each), and a Sushi Chef Sleection (depending on the Chef’s mood) which was $60 meant for 2 people to share. 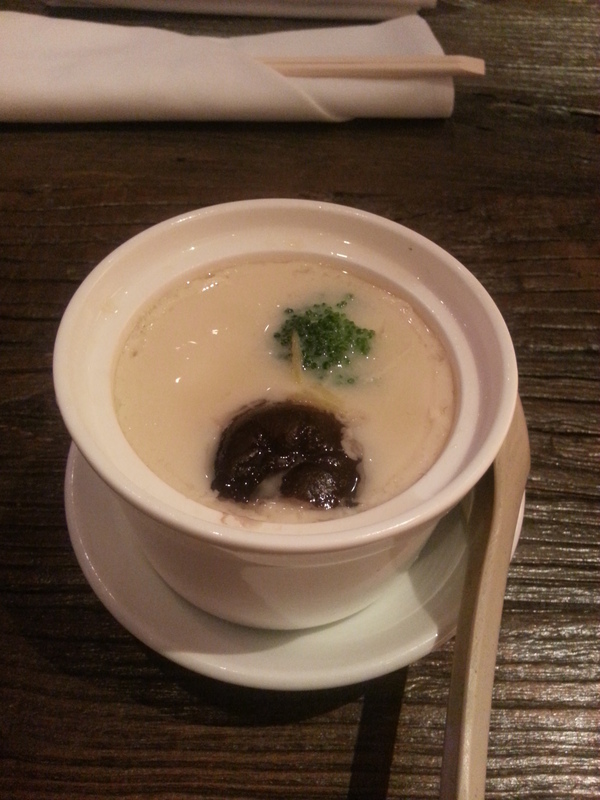 I also ordered a Chawanmsuhi (which they decided to name Shawanmushi..) for myself. 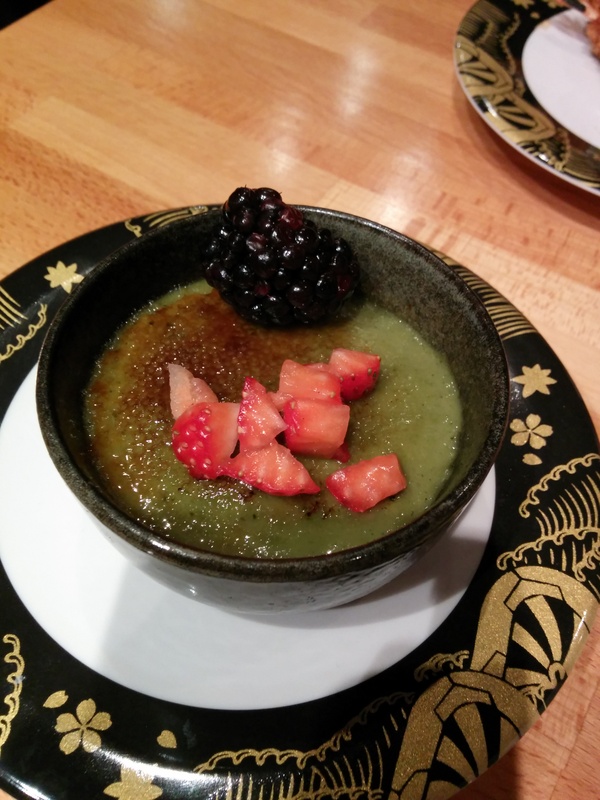 We’ll start with the Chawanmushi. It was quite delicious, and was scolding hot. 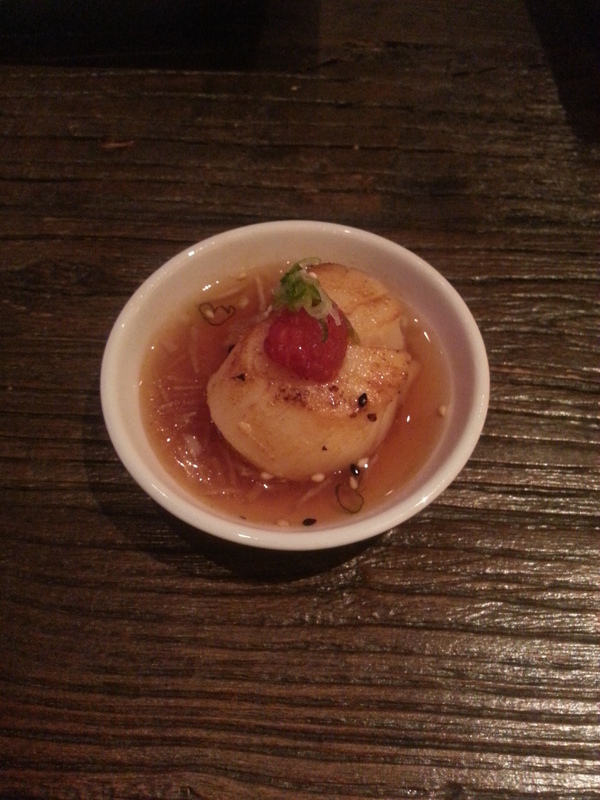 The egg was very very smooth, fluffy, very flavourful and had a good amount of fish and scallops. It was topped off with a shiitake mushroom and a piece of broccoli (which was insanely hot). I quite enjoyed this and was probably the best thing I ate at this restaurant. Next we ordered the Scallops which were flambéd in alcohol and served with ponzu sauce, fennel, raspberries and blueberries. It was quite nice but I thought that the alcohol was a little overpowering and was difficult to taste the sweetness of the scallops. The presentation was definitely good. 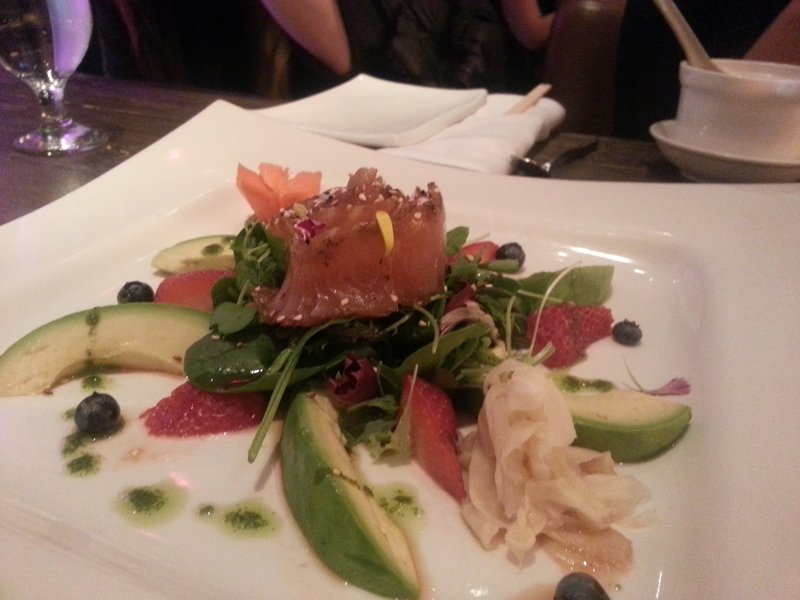 We also ordered the Seared Salmon marinated in ponzu sauce which was plated with an assortment of fruits, greens and avocado. It was enjoyable but I didn’t think that the 5 pieces of seared salmon was worth $18. The salmon was a little hard and seemed to have been sitting in that shape for a while. But at least the fruits were fresh. 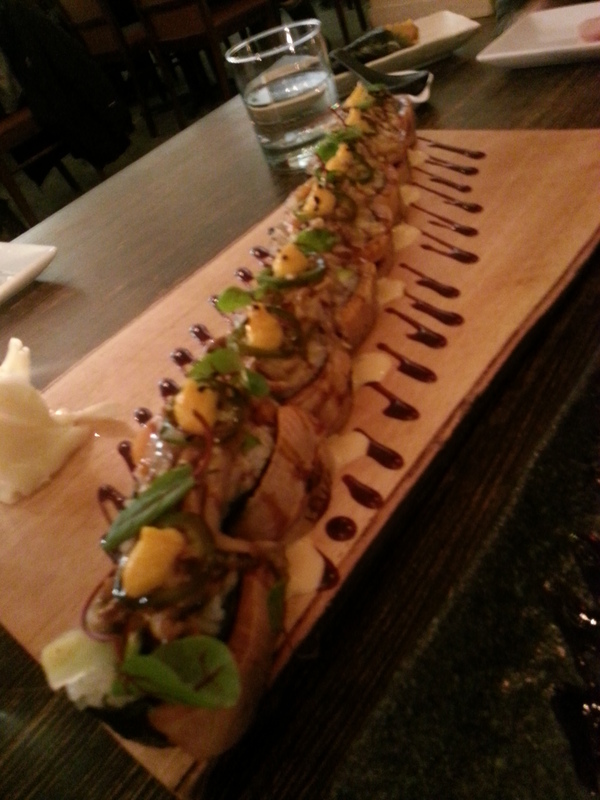 Last but not least was our chef selection sushi. This was the biggest disappointment ever. 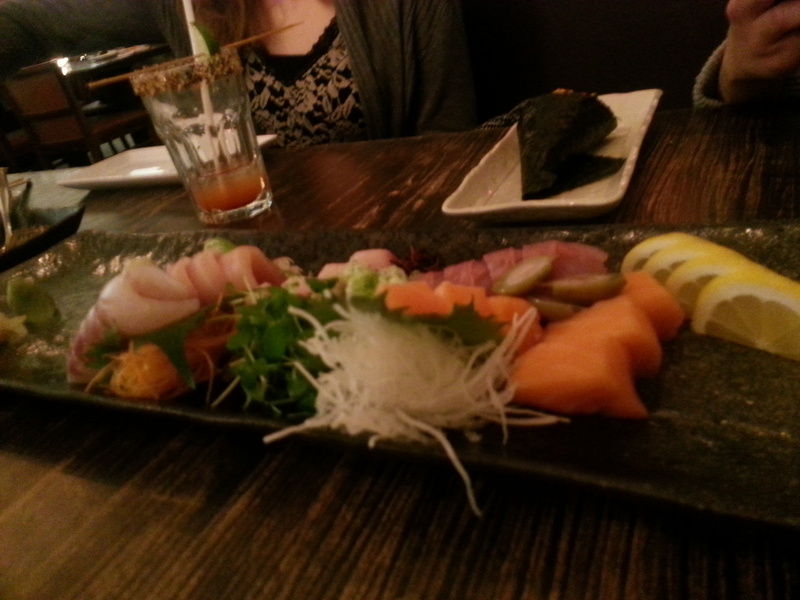 We were given california rolls, rolls with pickled vegetables and 6 pieces of sashimi. This was absolutely pathetic. The rolls were extremely messy, and they didn’t even take care to cut off the straggly ends. The rice was hard and cold, making all the rolls very unenjoyable. I cannot believe we paid $60 for this. I would definitely discourage anyone from coming here for sushi. Where I get takeout (sushi inbox) has much better quality of sushi than here and I only pay $12 dollars for 11 pieces. The service was very amateur and I felt that I was being served by a high schooler. He didn’t really care about us and was more focused on getting our orders down and then going to the back to play with his phone or something. One of my friend’s order was completely wrong only she was too hungry and nice to make him redo her order. We also get a random assortment of staff who come to tend to us which makes it extremely difficult to understand if we’re supposed to direct our requests (and complaints) to anyone or one specific person.